I’ve told you about Right @ Home before. They are part of the SC Johnson Family and offer really great tips for your home. They also provide us with great coupons! Sign up for Right @ Home and start getting high value household coupons. 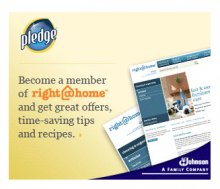 This is one of my favorite offers and it looks like this time they are offering coupons for Pledge products. It’s free and easy to sign up. $8 in Scrubbing Bubbles coupons! Sign up for Right@Home and get $8 in Scrubbing Bubbles coupons! I love Right@Home, you’ll get amazing high value coupons to use! My friend Yvonne just passed us this great freebie! Head over to Shout and get a free sample of the new Shout Color Catcher! You can also sign up for Right@Home for more great deals like these!